As a member of Social Security System (SSS) you are not just limited to housing and salary loan. Because SSS has several loan programs for those members who want to start a business and those who have a business and want to expand it. 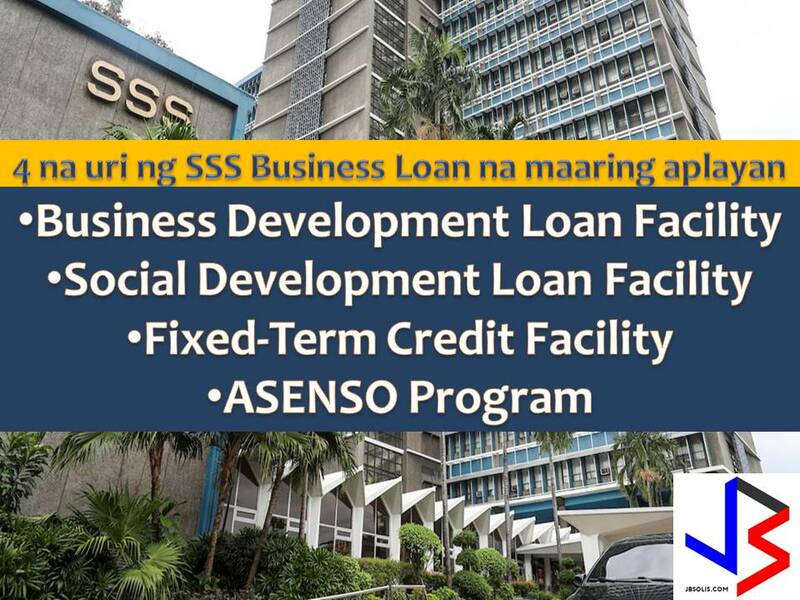 In SSS business loan, you can avail Business Loan Development Facility, Social Development Loan, ASENSO Loan Program and Fixed-Term Credit Facility Loan. The Business Development Loan Facility is a lending facility of the Social Security System (SSS) designed to contribute to the nation’s economic growth and development by providing financial assistance to the business sector for the purpose of increasing productivity and enhancing potential earnings through expansion, diversification and other business development projects. 4. Must be an SSS member-employer in good standing. The borrower is also subject to other criteria and policies which the Social Security Commission may impose from time to time. The Social Development Loan Facility is a lending facility of the Social Security System (SSS) designed to provide long-term loan assistance for the development of facilities and establishments of institutions that provides quality education or other academic training programs and affordable medical or health care related services to the general population and to SSS members and their dependents. It also aims to support the program of the national government to attain a better distribution of educational and hospital facilities throughout the country that will be more responsive to the needs of the particular localities and their inhabitants. 1. New or existing private medical institutions licensed by the Department of Health (DOH) either as primary, secondary and tertiary hospital including institutions for the aged or infirmed individuals. 2. New or existing private educational institutions, i.e. toddler/day care learning center, preparatory/elementary/secondary schools, collegiate/university level, school for special educations (SPED) as well as vocational and technical institutes which are duly licensed by the Department of Education (DepEd), Technical Education and Skills Development Authority (TESDA), Commission on Higher Education (CHED) and Department of Social Welfare and Development (DSWD). 5. Must be an SSS member-employer in good standing. 6. The borrower is also subject to other criteria and policies which the Social Security Commission may impose from time to time. SSS member-employers may avail of the loan facility through the SSS accredited participating financial institutions (PFIs) which will on-lend the fund to eligible borrowers for financing. 4. Maximum of P500.0 million per borrower. The interest rate of the loan may be variable or fixed based on the prevailing SSS pass-on rate to PFI plus PFI’s spread. The prevailing interest rates shall be reviewed monthly. The loan shall be payable monthly, quarterly, semi-annually or annually based on the PFI’s approved amortization schedule and shall have a maximum term of fifteen (15) years with a three (3) year grace period on principal payment. The loan with a term of more than fifteen (15) years and a grace period of more than three (3) years may be allowed for loans to be used to finance projects in extractive industries and forest development related projects including those with exceptional cases that require longer tenor, provided, the term will not exceed twenty-five (25) years. The loan shall be secured by any collateral acceptable both to the PFIs and the SSS provided the loan is fully secured. No pre-termination fee/penalty shall be charged in case of pre-payment of the loan. The Fixed-Term Credit Facility is a lending facility of the Social Security System (SSS) designed to provide sustainable fixed-term credit facility to SSS-accredited participating financial institutions (PFIs) for re-lending to eligible private enterprises in order to improve and hasten their operations for a more globally competitive market. It also aims to enhance the facilitation and flow of credit for the business sector to support the organization and expansion as well as rehabilitation of business operation. The eligible borrowers/end-user must be an SSS member-employer in good standing. The loan may be used for any purposes provided approved by the PFI. The PFI shall submit a letter of intent to avail of the loan together with the Term Sheet. The loanable amount is the sub-limit of the omnibus credit line (OCL) but should not exceed 80% of approved OCL of PFIs (net of availments). The interest rate of the loan shall be the prevailing fixed rate. The loan shall be payable quarterly, semi-annually or annually and shall have a minimum term of five (5) years up to fifteen (15) years inclusive of a maximum five (5) years grace period on principal payment. The loan with a term of more than fifteen (15) years up to twenty-five (25) may be allowed for special projects. A pre-termination fee of one-half of one percent (½ of 1%) percent of the loan shall be charged in case of pre-payment of loan within the first five (5) years. The manner of availment/releases shall be in batches of not less than Php10.0 million. The SSS shall release the loan through Real-time Gross Settlement (RTGS) or through direct transfer of the fund to the PFis depository bank which should be an SSS depository bank. Any principal and/or interest not paid on due date shall bear an additional interest at the rate of one and one-half (1½%) percent per month computed from the due date until fully paid. The Access of Small Enterprises to Sound Lending Opportunities (ASENSO) formerly SULONG Program by the government financial institutions (GFIs) is designed to give small and medium enterprises (SMEs) greater access to short and long-term funds by simplifying and standardizing the lending procedures. All industries except trading of imported goods, liquor and cigarettes and extractive industries like mining, quarrying, etc. The loanable amount shall be 70% of the value of the Letter of Credit (LC)/Purchase Order (PO) for export financing or 70% of the working capital requirement, up to a maximum of Php5.0 million. The Loanable amount shall be 80% of the incremental project cost, up to a maximum of Php5.0 million. The loan shall have a maximum term of one (1) year payable monthly. The loan shall have a maximum term of five (5) years, inclusive of a maximum one (1)-year grace period on principal monthly amortization. Assignment of Lease Rights (if franchisee) The loan shall be secured by any collateral acceptable both to the PFIs and the SSS provided the loan is fully secured.